On this week’s Here and Now, Katee’s guest is 17 year old singer songwriter Matthew Gibb. Matthew Gibb loves music – any music – and this goes beyond singing and playing acoustic to playing electric and bass guitar, drums, keyboard, ukulele, mandolin and (slowly improving!) piano. In his spare time, he aims to make folk smile by being a crowd-pleasing musician. He considers himself lucky that folk book him for Weddings, Christenings, birthday parties, etc. Over the past four years Matthew has been performing covers and playing his own music at numerous and varied events. He can play around 250 covers from 50s to current chart music. Matthew enjoys playing to small audiences in cafés and bars but is equally comfortable performing in front of thousands e.g. Christmas lights, Hogmanay & Fireworks events across Scotland; providing pre-match entertainment for The Braehead Clan and Glasgow Tigers. Last summer, he performed at the Edinburgh Fringe for the fourth year in a row. Matthew busks! He has played his way across the UK and Ireland. “Through music,” he says “I have enjoyed many fantastic opportunities. 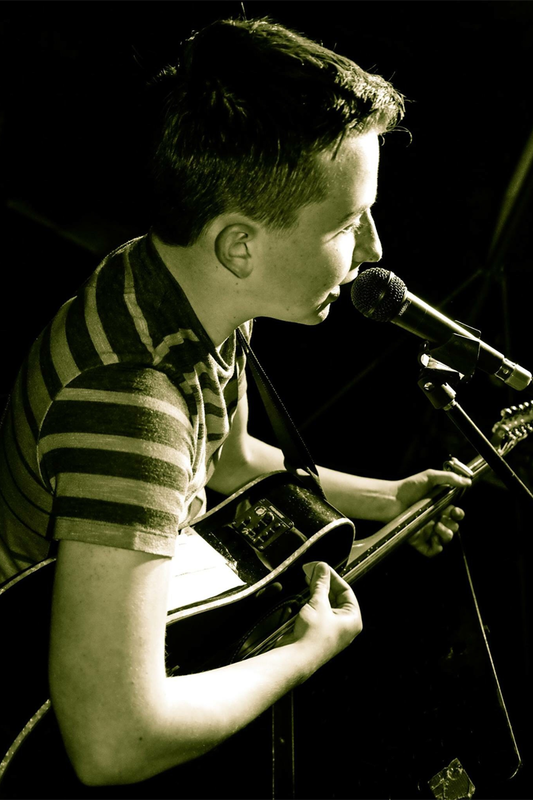 I’ve played live on Radio 1 and on many local Scottish radio stations and have appeared on STV Glasgow.” Matthew was a finalist in The Young Scot Awards 2015 and won the inaugural Jim Diamond Music Award for young, talented Scottish musicians, clearly a well deserved winner. Matthew is currently recording his first EP. Matthew is using his music to fund-raise to enable him to go to Malawi with his school in June 2018. He aims to surpass his target by enough to buy ukeleles from local craft workers for the schools where he will be based, so he can teach local Malawian schoolchildren how to play the instruments. He has raised over £14,000 for various charities and is frequently asked by charities to perform at events or busk. Matthew never refuses to help if he is free and does not take any payment. He believes he is blessed that he can help others. He also teaches guitar to young and old. He is particularly proud of teaching one gentleman so he could surprise family and friends playing at his son’s wedding. Matthew’s other interests include photography, reading thrillers and ice-hockey.